I'm back! Did you miss me? A few of you faithful readers emailed me to ask if I was okay and that was so kind of you... I've simply been away from home more days than I've been at home this month. The first week in August found me relaxing at the (very rainy!) beach in North Carolina with my husband's family for our annual reunion. And then we were home for only five days (while I did laundry and repacked our suitcases) and jetted off to Panama! Yes, Panama--quite an adventure! If you'd like to "travel along with me," I'd love to have you... But, first, let's begin with what I've been stitching, okay? This was the very first piece I've stitched by The Scarlett House, but it won't be my last. I truly loved everything about it (even if I did have to rip out that bottom border twice to get it right!). Isn't it sweet with that many-windowed white house framed by giant strawberries? And the huge birds and the tiny kitty (or puppy!)... I wanted the strawberry color to look like that shown on the front of the chart (which is called "Strawberry House) so I chose to use Classic Colorworks "Clay Pot" as the skein of the suggested GAST "Pomegranate" that I had was just not right. I love this pinkish-peachy color so much! I also have a new bee finish to share with you. I know you've seen this one many times and perhaps some of you have stitched it yourselves. But, have you seen it stitched "over one?" So tiny and I made it into another sweet pillow for my bee bowl. This is "Honeybee Sampling" by Little House Needleworks stitched "over one" on 28 ct. mushroom Lugana using DMC threads. 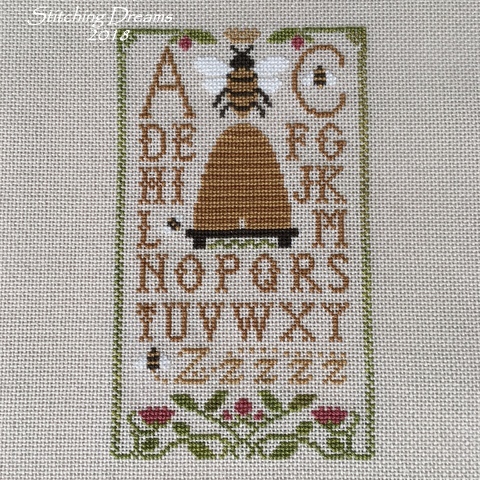 Little House Needleworks "Honeybee Sampling" stitched "over one"
I have a couple other bee designs almost finished so I'll share those with you next time. That may be it for my bee stitching this summer. I'll show you all of my 2018 bee creations when I'm done for this year. I do plan to keep up the bee stitching next summer, too--so many of you sent me the most delightful bee charts and I really want to stitch them all! If only I had more hours in my day! So... let's go to Panama! Have any of you visited? It certainly wasn't a country that was on my "must visit" list, but when you have a son who lives all over the world, you get to visit some pretty interesting places. He's inspired us to visit Seville, Spain in 2011 and then travel to Buenos Aires and Patagonia in Argentina (with a side trip to Uruguay!) in 2015. Our youngest son has been living in Panama since March of this year and will wind down his duties at the end of September. I can tell he is having very mixed feelings about returning to the daily "rat-race" that he experiences in Washington, DC. Life in Panama is much more easy going and laid back. People simply seem more relaxed and I hope my photos will help you get a feel for the country. So, grab a cup of coffee or tea (or, in my case, hot cocoa! ), sit back, and please join me for a visit to the most modern of Latin American countries! This raspberry-chocolate dessert was waiting for us in our hotel room at midnight! Did we save it for the morning? No way!! We arrived in the dark, but the next morning we opened the curtains in our 25th story room to reveal this spectacular sight! This is the view my son gets to enjoy every morning (just two floors below!). Below is a view from his bedroom window looking up the coast the other way. As you can see, this is a city of high-rises that houses almost 900,000 people (1.5 million in its metropolitan area). It has a very Americanized feel to it (think Miami!) due to the presence of so many Americans living there from the time the Panama Canal was being built in the early 1900s until the control of the Canal was fully turned over to Panama in 1999. Panama City, Panama--one skyscraper after another! My son knows me well and knows I am not really a "city" person, so he suggested we rent an Airbnb in the Casco Viejo section rather than stay in the busy city. This charming historic district was settled in 1673 and was named a "Unesco World Heritage Site" in 1997. 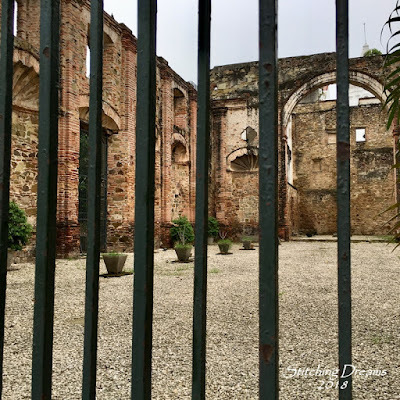 After the original location of Panama City (now know as Panama Viejo) was virtually destroyed in 1671, the remaining inhabitants moved to this more protected location on a narrow, rocky peninsula. 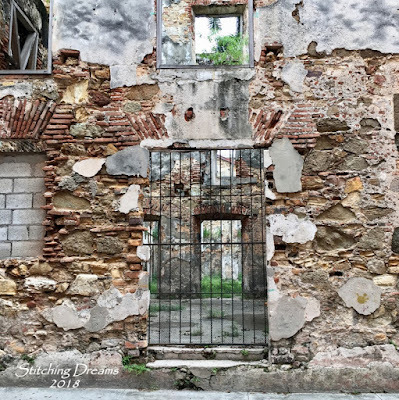 Casco Viejo is an area of contrasts--you will find a beautifully renovated home right next to a dilapidated ruin with trees and vines growing out through the windows. 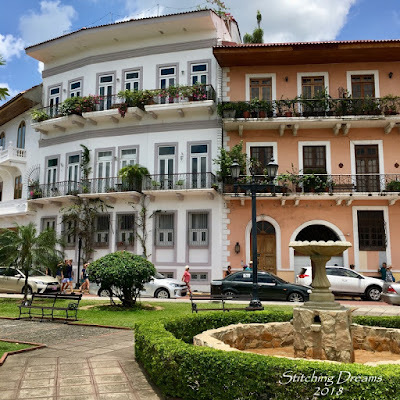 Casco Viejo thrived until the 1930s when its wealthier residents began moving away from the narrow streets and older architecture to the more automobile-friendly, modern suburbs. 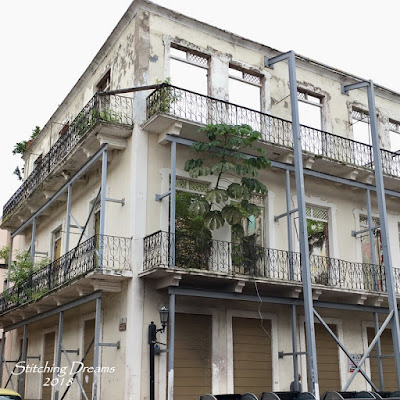 The area fell into disrepair and despair--and, by the end of the 20th century, it was filled with not much more than weed infested, crumbling buildings inhabited by vagrants and squatters. 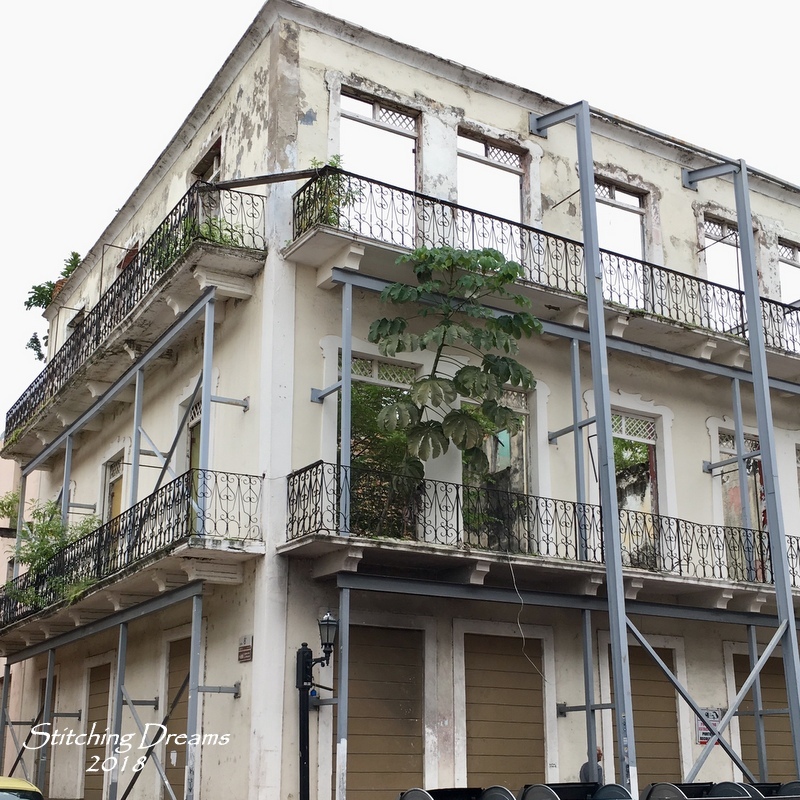 Shells of some buildings are still standing waiting to be remodeled and given a second chance at life. Fortunately, the designation of the area as a World Heritage Site in 1997 brought new hope and, that, along with some government tax incentives, have helped the area begin to turn around. Today you can find beautifully restored examples of French, Spanish, and American colonial architecture on display. 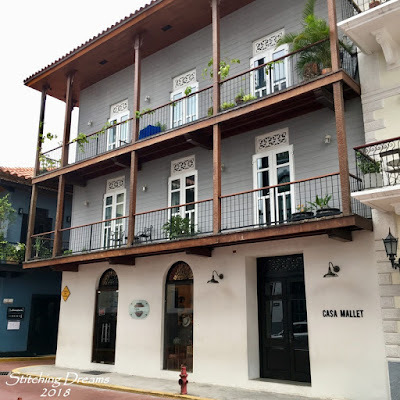 Casco Viejo has now become the hip new neighborhood in which to live, filled with many restaurants, shops, and clubs. Just look at all of the gorgeous architectural details in this one! Of course, the blue house by the sea was my favorite. Big and beautiful doors were everywhere! Iglesia de La Merced (built in 1680)... it is said that the front facade was carried piece by piece from its original location in Panama Viejo! 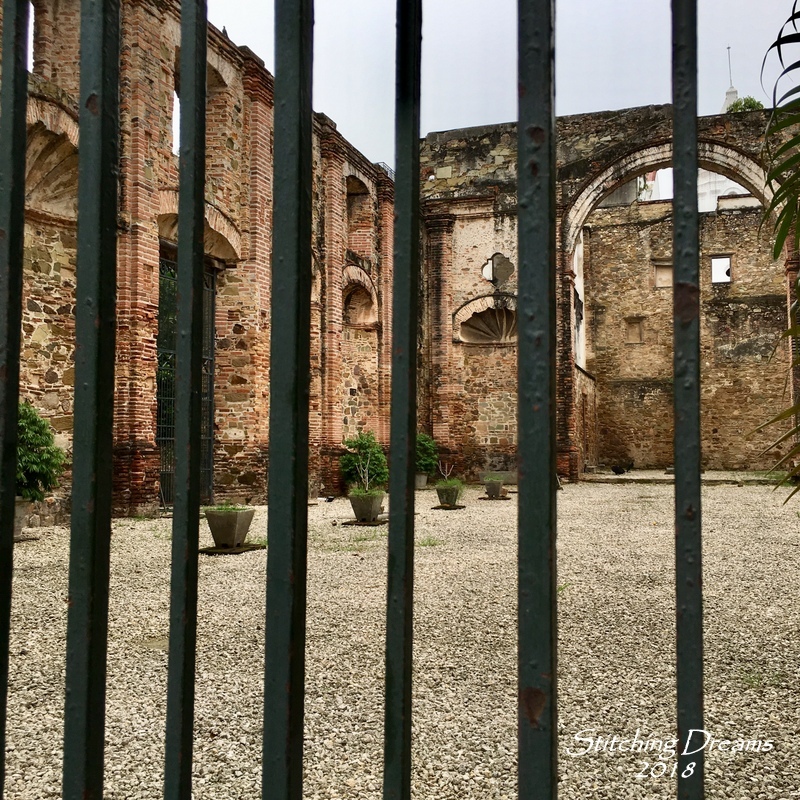 If you peek inside the former Jesuit monastery, you'll notice many little snail-shaped niches which were built to honor the wealth of marine life in Panama. 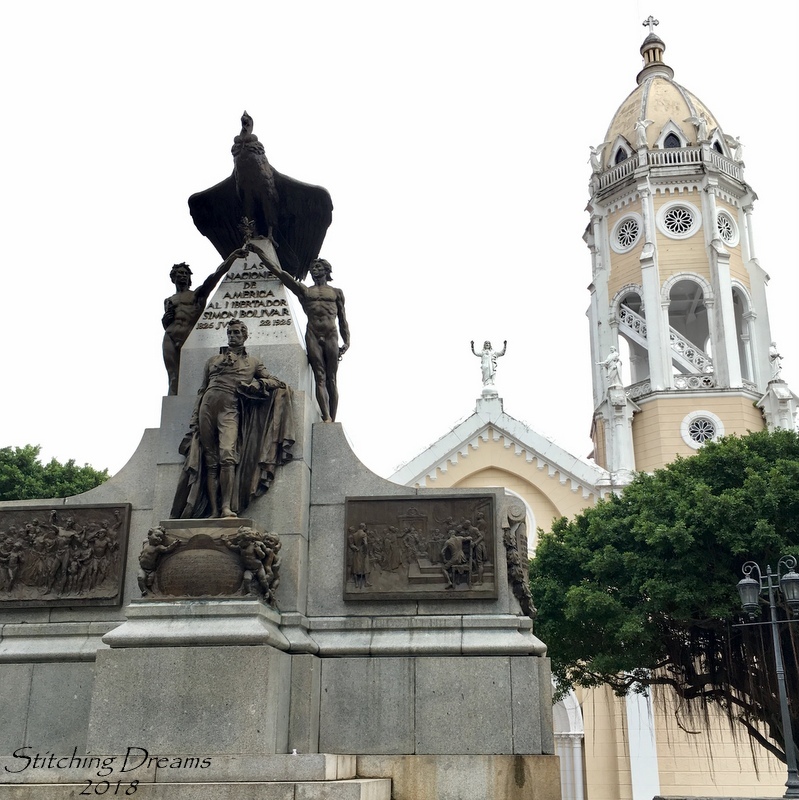 This was originally the barracks of the Spanish troops, but it was made into a monument to honor the many Frenchmen who died in their attempt to build the Panama Canal. And speaking of the Panama Canal--you really can't visit Panama without stopping by to see one of the world's most amazing engineering marvels. The path to finishing the 51 mile long strip of land into a navigable waterway between the Atlantic and Pacific Oceans was begun by the French in 1881. However, due to huge loss of life (over 20,000 men died during the building of the canal due to accidents, tropical diseases, snake and insect bites, etc.) and engineering problems, the United States took over the construction in 1904. By 1914, the canal was open, saving weeks of travel time for ships that formerly had to pass around the tip of South America to sail from the Atlantic to the Pacific Ocean and vice versa. Unfortunately, we didn't choose the best day to visit the canal! Who knew it would be school visitation day?! Hundreds of very (very!!!) excited children ranging from kindergarten through high school age were there with us. I wish I'd taken a photo of them in their colorful school uniforms! The noise level made it impossible to hear what the announcer was saying as we watched a huge ship pass through the canal. Luckily, we were able to watch a film and walk through the museum to learn more on our own. A huge freighter enters the left side of the locks and the water level is raised. Whew! This is getting way....too....long! I will share three more photos with you and then continue my Panama tour in my next post. Below is the Airbnb where we stayed in Casco Viejo--a wonderful location within walking distance of so many little shops, tasty restaurants, and interesting sights. My oldest son and his wife went with us, my youngest spent a few nights there (a nice change from his long hotel stay! ), and there was a third bedroom for us. I love the Airbnb experience and find it so much more relaxing (and less expensive!) than hotels for a family like ours. The view from our balcony--can you spot the skyscrapers of Panama City in the distance? Love your strawberry house! What wonderful job of stitching and framing. Nice to have a personal shopper to find those vintage frames! The Bee is gorgeous. So adorable over-one with your trademark pillow finish. That Panama vacation was like the trip of a lifetime. Such fabulous accommodations from the great hotel with chocolate greeting to the sweet B&B. And so many picturesque locations. I love your two newly finished stitching projects. 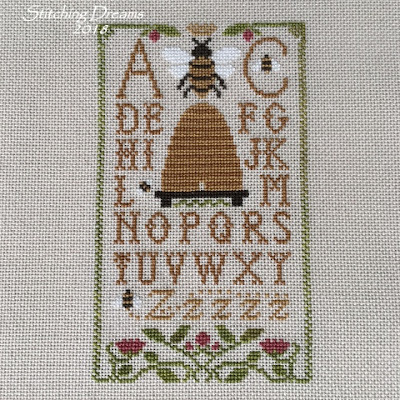 The Strawberry House is gorgeous and I love the beehive ABC with the extra Zs for the buzzing bee! What a fabulous trip to Panama you had to visit your son. So many interesting things to read about, including the famous Panama Canal! What exciting travels! A lovely shot of you both relaxing on a bench and the fabulous welcome cake!! Carol, both your stitches are lovely. Your bee stitch is so tiny and will be a great addition to your bee bowl. I love how you finished your Scarlett House piece. I totally enjoyed reading part one of your trip to Panama. Sorry you had a rainy trip to NC! Beautiful Stitches and what a great vacation. I love the area where you stayed.....just beautiful. LOVE love love the Strawberry House. I have had that on my want to buy list for a good while. That house just draws me in. Yours is beautiful as always. Can't wait to see all the bee stitches. The pictures from your vacation are really pretty. A good vicarious tour. I learned quite a bit too. Looking forward to the other pictures. Carol, You know I love the tiny be piece..so sweet!!! 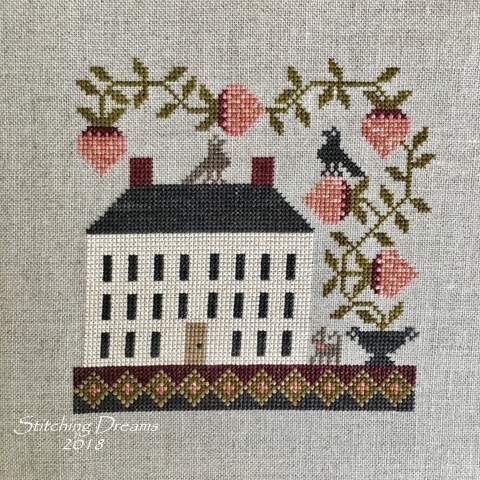 I stitched the Strawberry House piece when it was a club kit. I will send you a photo of how I finished it....it's one of those "what was I thinking" projects that despite a "boo-boo" turned out very cute. 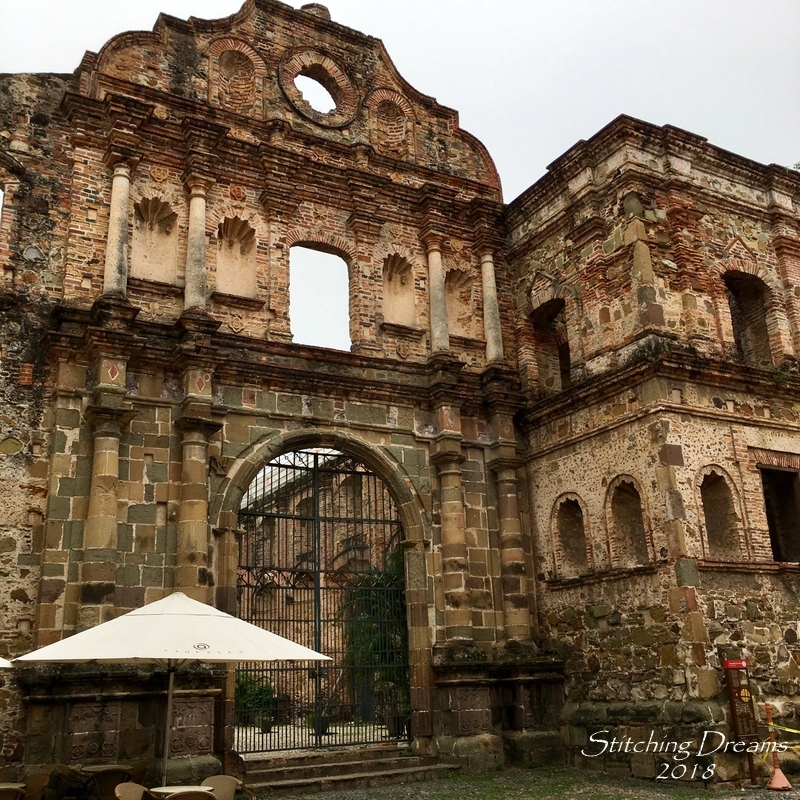 Panama looks beautiful and very interesting--is it always hot there or do they have a cooler season? Thanks for taking us along on your journey and I look forward to future installments! Looks like a wonderful vacation, what a beautiful place! Your honeybee stitching is so sweet!! Oh I love your Strawberry House so much, Carol. The colors, the shape and how you finished it up - everything is so perfect and gorgeous! Love your bee stitching too, of course - and as always I admire your 1 over 1 stitching skills! As always I totally enjoyed your travellogue! How wonderful must that have been, spending time together with two of your sons at this lovely old place. Looking forward to seeing more picutres of Panama and reading more about your adventures there. Have a wonderful rest of August, my dear friend! The Strawberry House has long been a favorite of mine and I love how you finished it! I love your 'way too long' posts! I hope you never stop posting them. You wouldn't be Carol if you didn't over 1 28ct fabric! You do them well. Thanks for having us along on your Panama trip. Being landlocked here, I love to see these huge barges and tankers on the water. We saw that in New Orleans. Hope your Tuesday is a super one! Such an interesting post, Carol! I loved seeing the pics of Panama and of course seeing your truly amazing stitching. I know what it's like to attempt 1/1 on 28 lugana and I admire your accomplishments! They are both such treasures. Looking forward to going to Panama with you again next time. Oh Carol -what a truly wonderful post! First of all, your stitching is beautiful and the finishes are so wonderful. I know everyone will love them and be so impressed with all of your creative work. Thank you, too, for sharing your trip to Panama. What a great trip for you and your husband and that you got to share it with your son. If I read this correctly, it sounds like your older son and his wife were able to come too. What a wonderful opportunity for all of you. 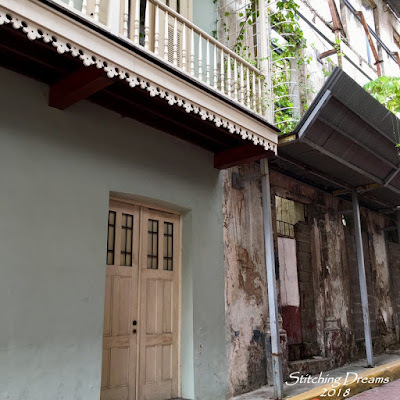 Panama looks so interesting and so beautiful - I loved seeing those gorgeous homes and even how a refinished residence is right next door to one that needs a lot of work. Thank you, too, for the information about the Panama Canal - so much to learn about it and it truly is quite fascinating. I think my mom & dad went to Panama on a cruise trip but I don’t really remember them telling us too much about it. It was very long time ago for them so who knows??? I think all of us are looking forward to your next blog post about your trip. Don’t ever think twice that your post is “too long”. I think we all truly love all of your posts and so enjoy everything and anything you share with us. Oh my Carol, thank you for sharing the Panama experience with us! I could not get enough of the beautiful architecture. What wonderful experiences you and your husband have during these travels. Good to have you back my friend . Just loved your stitching and the finish on both are so beautiful. What a lovely trip you both had , it looks beautiful there , always nice to see such lovely countries , and spending time with your family too what could be better . Have a good week hugs . Love the Strawberry House and the LHN finishes! Carol I love both of your stitches and finishes so much. They came out beautiful. I too have had no luck with pomegranate and always have to change to another color. I really love how the bee stitch came out using 28ct. over one. I love smaller designs and am always making mine as small as possible too. Wow, dear Carol! I'm with you on a trip to Panama! It's so beautiful! Your cross stich, as always, I like! I really like both of your finishes and using the gingham border really sets off the berry house design. Anxious to see more of your trip. Can't believe the Patagonia trip was THREE years ago!! Thought it was last year! Really enjoyed the photos and I'll be the next nature batch will be fabulous. Hi, Carol! Love your stitching and finishing. The white frame is just perfect - I love how you distressed it, too. What did you use to distress it? That can be harder than it looks! I can't wait to see all of your bee finishes together - that is such a neat idea. I really like the contrast between the neutral DMC cording and the black gingham bow. Well done! Panama sounds like an amazing adventure! My mom loves to travel. She will turn 80 later this December, and just before her birthday, in November, she is going to Cuba. She has been to Puerto Rico, Peru, South Africa, Australia, Fiji, New Zealand, Spain, Turkey, Italy....and so many more places in Europe. I think it's a wonderful thing to see how other people live. And when you get home, don't you have a different view of your own life? Strawberry house is fabulous! The change of pink thread looks perfect! I have got to develop more confidence in doing that. You know I love your bee pillow! I love your Panama photos and narration! I think it is much more interesting to see the city from the ground instead of just cruising through! Your airbnb neighborhood looks so charming! Cant wait to see more Panama photos. So glad you werent done in by the hike through the jungle! Your finishing is just as lovely as your stitching Carol. I loved all the pics of your trip. It looks like you had a wonderful time. Strawberry House is so pretty. I love the colors you chose. Plus what a great frame for the design. I know what you mean about finding a place to show it off. One of the things I like best about blogging is seeing all the different places where people live and visit. I loved the Panama photos. A dear friend went on a Panama cruise a few years ago and really enjoyed it. I look forward to seeing the rest of your pictures. It does help to have children who lead adventurous lives. We ended up here in the NW thanks to Laurie and her travels. Your needlework is so beautiful. I saw the "Mum" pillow on one of your other blogs from a couple of years ago. The colors are lovely! I had no idea Panama had sky scrapers, let alone so many! Silly me. I thought it was one long canal and a lot of small adobe houses. Thanks for the wonderful pictures and descriptions. Very well done. Carol, you are an amazing stitcher and blogger. Your travels are so interesting. I'm not a traveler so I go sightseeing through someone like you! Your Strawberry House and Bee Sampling are perfection. The trip to Panama is fascinating...thanks for the details! 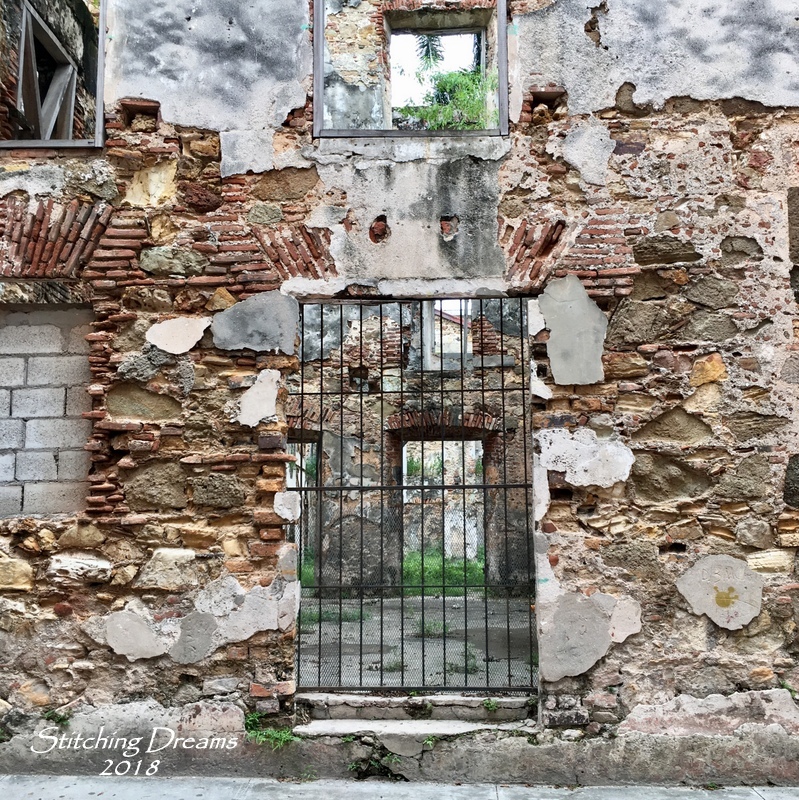 The architecture is beautiful....even the crumbling buildings spark the imagination, don't they? What a fabulous city Panama looks like! Very pretty buildings and so colorful! Sounds like you guys had a wonderful visit with your son. Thank you for the history and pictures. I love to armchair travel. Thank you for taking so much of your time to share. Amazing photos. Your stitching turned out beautiful and of course I love the “repurposed frame!” Right up my alley. Thank you for sharing your trip of Panama with us. I have never been to South America or stayed in AirBnB. I love reading about people's travel experiences. Panama seems a great mix of old and new. Yes there is a charm in old ruins too. Looking forward to next two post in the series.If possible, do share something about the food you ate there. deine beiden Stickereien sehen wunderschön aus. Der Rahmen passt perfekt zu deiner Stickerei. Danke fürs Teilhaben an eurer Reise. Ich freue mich schon auf die Fortsetzung. So pretty. and your Bee finish is too darn cute! Thanks for sharing all of your pics from Panama. Carol, I enjoyed your travels in Panama City so much, I had no idea it was such a modern city with so many skyscrapers!! The view from your son's hotel was amazing but like you, I would much prefer staying where you stayed. I love the old building and such fabulous architecture. I'm looking forward to hearing all about your hike, you certainly have exciting adventures! The Scarlet house is really sweet and how neat that your son looks out for frames for you!! This one is perfect for the stitch. Your bee stitch is adorable!!! Looking forward to your next travel post!! I always love reading your posts and this was no different. You stitching is beautiful. Love your tiny finish. Can't wait to see your bowl full of bee goodies you've finished up now. Your trip to Panama is just Wow. 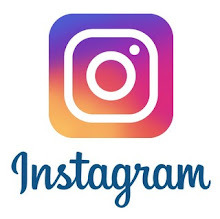 We only travel in the US so I enjoyed following along your journey. Thanks for sharing. What a beautiful area. We love going to locks so this would be a fun area but we will stick to our US locks instead. We love watching those huge freighters. We like to travel north to Michigan and watch them go through the Soo Saint Marie Locks. I look forward to your next posts. Strawberry House looks great, i love it - next year I have some plans with strawberries. And the finish is great, the frame fits perfectly. I have already seen some bees motifs, and your finish is also perfect for this motif. Thank you for the great pictures from Panama, that seems to be a really interesting city and I'm looking forward to the next pictures. Thank you for taking us on tour to Panama!! 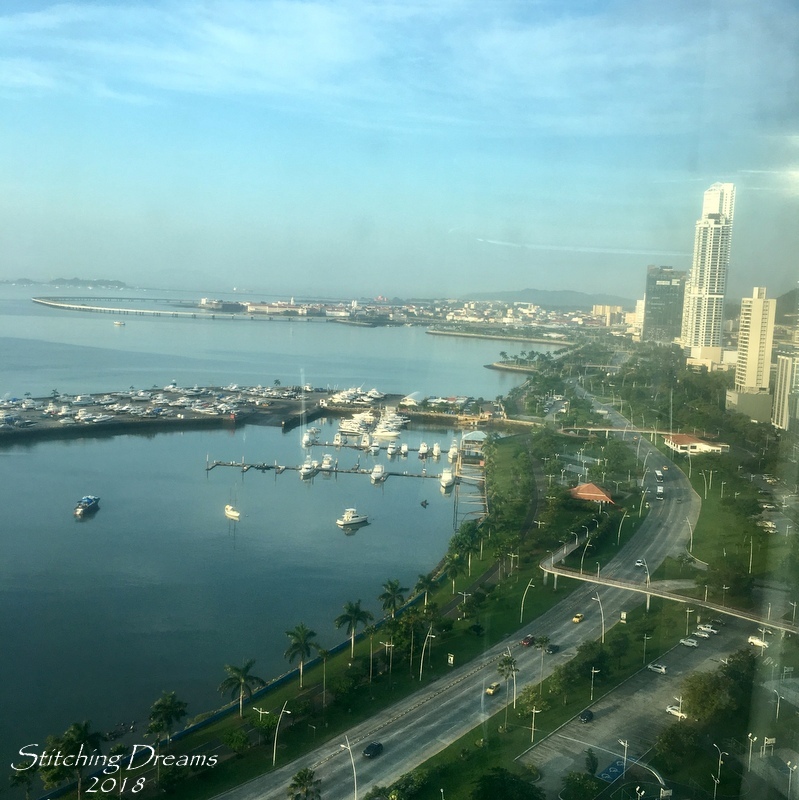 I enjoyed seeing Panama through your eyes! Sounds like a wonderful trip! Love the strawberry house and your bee pillow! Strawberry House is simply beautiful and your Bee pillow so sweet Carol. What a wonderful holiday you had,so many great photos,I enjoyed them all. i love your Strawberry House and your Bee pillow to, your finishes are perfectly! Thank you so much, your photos are great! Holidays are wonderful! Hi from sunny Cambridgeshire in England. I was so interested to read about Panama and see the photos. It is one of those countries you only know one thing about - in this case of course the canal! I look forward to hearing and seeing more. The Scarlett House finish is wonderful and the little bee piece over one is so pretty. You always provide such a lot of inspiration for us stitchers. Lots of pretty stitching you have been managing to do even with the adventures you've been having. Your clay pot thread choice is the most perfect substitute. The blue house by the sea does look inviting. Love your cross stitch and your finishes but was entranced by your pictures and travelogue of Panama! Thank you so much as I will probably never get there and I love to 'armchair' travel. I especially love blog posts as they are more personal and also you see things you never see on travel shows. I was thrilled to read and be able to share in your adventures! I can't wait for the next installment. Meanwhile, I have been stitching away! Lovely stitching, Carol! The Strawberry House is very sweet, that frame is perfect! Wooow, how exciting! What a wonderful und interesting holiday. Thanks for sharing. Your strawberry house is awesome. Strawberry House is so pretty, Carol! Everything came together very nicely, and now you have a lovely piece to display. Your son has a good eye for frames. : ) And your little bee finish is so tiny and perfect! What a fabulous trip! Love the architecture and that blue house by the sea especially! And what a lovely Airbnb apartment! You sure had a gorgeous view from your rooftop deck! Always love reading about your adventures! 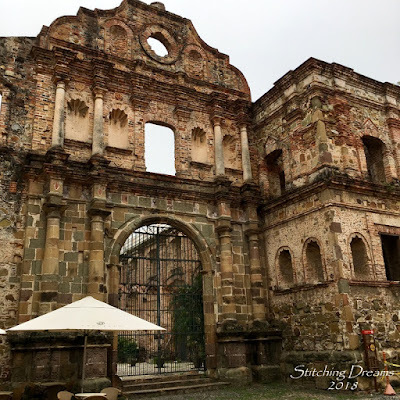 Your photos of Panama look lovely! I'm looking forward to the next two parts - especially about the hiking! Your stitching and finishing as always is just perfection! Love the frame your son found for you. Sweet! Your finishes are beautiful. Love how you have finished Strawberry House and the bee stitching is just delightful. So delicate. Looking forward to your next chapter of your adventures in Panama. It looks a wonderful place. You are better than any travel agent at showcasing a country/place. What a fascinating place to visit Carol. Thanks for sharing! I'm glad you were able to visit while your son was there. I wonder where he will go next?! Wow! Carol, Panama looks amazing - thank you so much for sharing your experience with us. Lovely stitching and finishing on Strawberry House, too. Welcome home Carol! I enjoyed seeing your 2 newest finishes as well as the Panama photos. 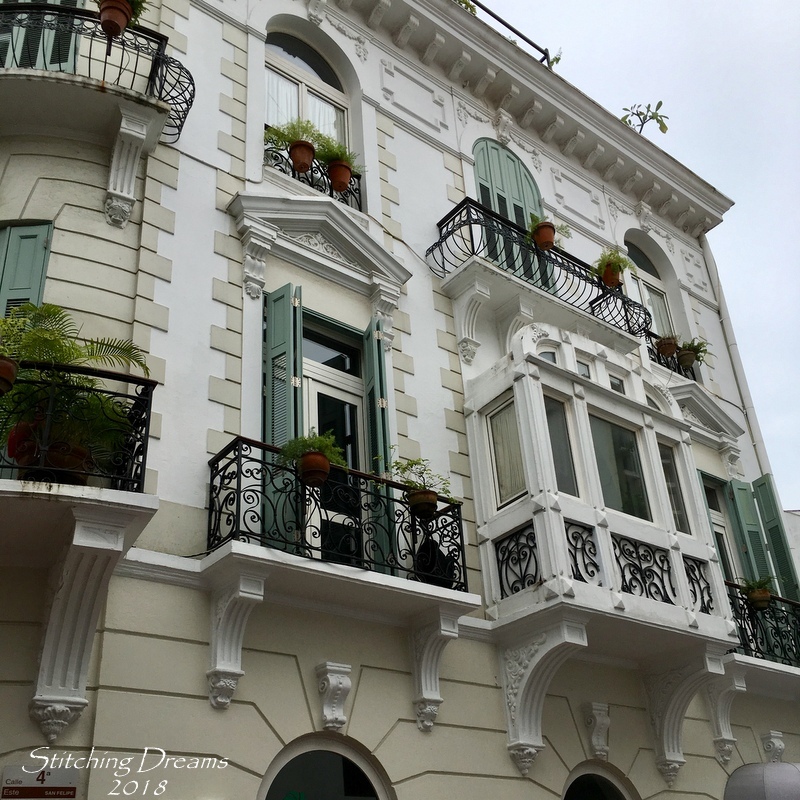 I think I too would love the Casco Viejo section of the city. It's great that your sons adventures allow you to see place you might not otherwise go. Wow! What a beautiful place to visit! I love the feel of the architecture in the area you stayed! I enjoyed reading all the history of Panama that you wrote and seeing all the gorgeous scenery! And now I'm freaked out by your mention of surviving a hike? Yikes! Love your stitching finishes as well. Boy, you've been busy! Good luck to your youngest on the move back to Washington at the end of the month. He seems to have picked a good job to satisfy his travel desires! Fab pics of Panama sounds as though you had a wonderful time and love that strawberry cross stitch, very pretty. Great stitching - the colour of those strawberries really is lovely. And a great vacation too! Panama wouldn't be on my must-visit list either, but it does look more interesting and beautiful than I would have imagined. I really like your Strawberry House sampler which is just perfect in the white frame. Thank you for sharing your trip to Panama with us, many interesting photos showing such contrasts of a modern city and then the Casco Viejo. wonderful view from your hotel room. Ahhhh, strawberries and bees are two of my favorite subjects! Lovely stitching and finishing! Panama looks so interesting! My uncle took a cruise through there as it was on his bucket list. They live in Nova Scotia so I haven’t been able to “get the scoop” on their trip yet. Your photos are wonderful! Strawberry House looks so gorgeous in its frame. I have the chart somewhere in my stash but haven't come topstitch this little beauty. Also the little bee pillow is so darling. Thank you so much for a first view of your Panama adventure. All these lovely pictures of so many different sites showing the different styles you find in the city. Hi Carol! I’ve had your post waiting in my feed until I could find a nice time to sit down and really read it, and I am so glad I did! 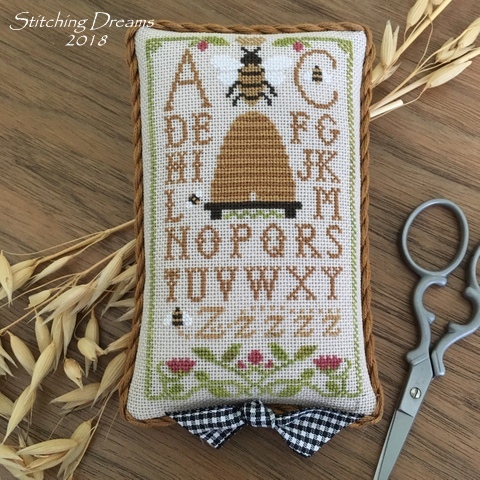 Your stitching is lovely as always and I really like the bee theme that you’ve started. I look forward to seeing them all in your bee bowl! 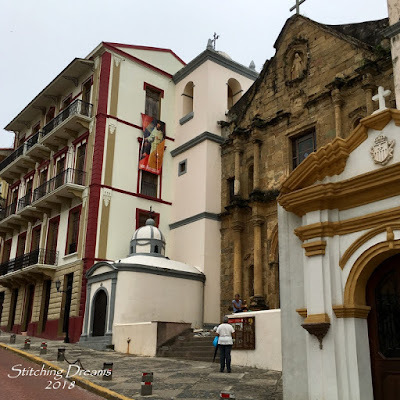 Absolutely love the pictures from your trip to Panama - how interesting to see all the old and new structures and learn a bit of the history. Like you, we are fans of vacation rental homes, and yours looks like it was a great one for you all. Looking forward to hearing about the next parts of your trip, especially that hike! Hope you have a great weekend with some relaxing stitching time! Love all of the buildings in Panama. A very pretty city. Your finishes as always are super cute. I cannot believe it is fall. Stitching and travel go hand in hand. 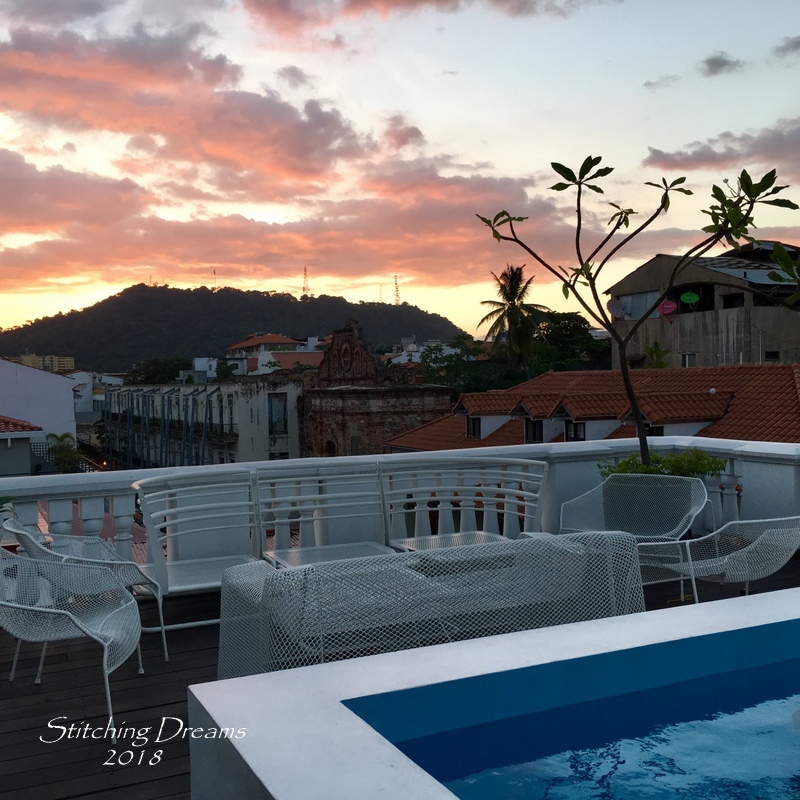 Love the pieces you've stitched and finished as well as seeing your travel pictures. Beautiful finishes. I love your 'over 1' projects. I wouldn't have put Panama on my 'must see' list either but your photos show it has a lot to offer.